The Waterford manager and the former Clare boss don’t really see eye-to-eye, do they? 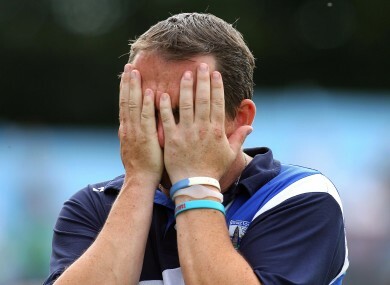 DAVY FITZGERALD LASHED out at Irish Examiner columnist Tony Considine last night, branding his recent criticism of the Waterford hurlers as agenda-driven rubbish. Speaking on RTÉ’s The Committee Room, Fitzgerald said that it’s easy to laugh off Considine’s attacks as the former Clare selector has never played hurling at the highest level or proven himself as a manager. “Criticism is funny,” the Déise boss told Marty Morrissey last night. “You’ve the likes of Tony Considine, an ex-selector with us, and he’d be writing a lot of stuff. I actually laugh a lot about this one because Tony probably never played senior hurling with county or club and he’s never managed a team to do anything. Fitzgerald’s comments are the latest in a long-running disagreement between the pair, dating back to 2007 when Considine’s appointment as Clare manager saw the four-time All-Star keeper retire from inter-county hurling. “Everybody is entitled to their opinion but you’ve got to get out there and be stuck in this game at a high level,” Fitzgerald said. The most important thing about criticism is that it’s important to be balanced and not have agendas. That’s the big thing I would see out there. Email “'He’s never managed a team to do anything': Davy Fitz hits back at Considine”. Feedback on “'He’s never managed a team to do anything': Davy Fitz hits back at Considine”.